There’s nothing like quality flavoured syrup to add some interest to your regular cup of tea. Nowadays, they are quite easy to find in the shop. Even most cafe’s recommend it as an alternative to simple sugar. In my opinion, there’s no reason to go out of your way when you can make some on your own with what you have around. It’s simple and barely takes any time to prepare. Today, I thought i’d try my hand at some strawberry syrup. I always have some strawberries lying around to enjoy with my morning Weetabix. The process of making flavoured syrup is just as straightforward as adding fruit or herb into classic simple syrup as you make it. Add the sugar and water into a saucepan and bring to a boil, stirring frequently until all the sugar is dissolved. This is how you make simple syrup for your bar. 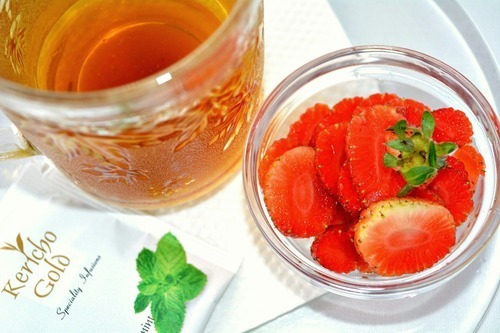 Once boiling, reduce the heat and add the strawberries. Stir lightly and let it simmer for 2 – 3 minutes. After this, it is up to you. Tasting is the best way to gauge how sweet it’s gotten and whether or not you want it to stay on the heat longer. I usually turn it off after 5 minutes or until the strawberries lose most of their color. Let it cool then pour into your desired container. I got these cute bottles from Nakumatt at only 1,250 for a pair. Now you have a thick, sweet strawberry syrup for your tea, cocktails and even on top of your favourite Ice-Cream. I find that it complements Peppermint tea quite well. I recommend Kericho Gold’s Peppermint tea as the liquorice in it adds a nice, clean, candy-like element that makes this combination the ultimate treat for the sweet-tooth. Remember, Drinking is always fun when it’s done responsibly. 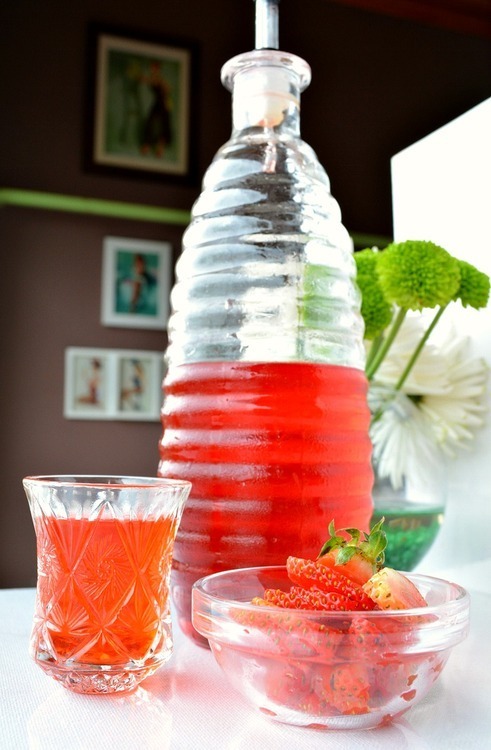 Flavoured tea’s are great for entertaining guests anytime, any weather, iced or hot. They also make a great non-alcoholic option for parties, and with these flavoured syrups, everyone will want to be the designated driver. The peppermint tea by Kericho Gold is quite a treat! It’s not just your regular mint and hot water. The flavours are blended together here to make a tasty chill in a teabag. The tea consists of mint and, the secret ingredient, liquorice. The liquorice really brings out the mint flavour, cooling as you swallow, as well as leaving a sweet, long lasting aftertaste that leaves you wanting more. The flavour is a bit too intense for me when it’s hot but it’s the perfect summer drink when chilled. It’s sure to complement any brunch food, that’s for sure! Remember, drinking is always fun when it’s done responsibly. 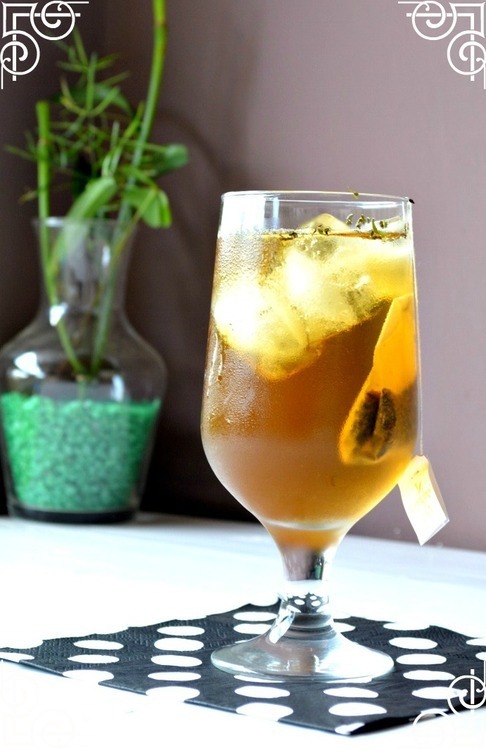 Iced tea is a great tasting, attractive, affordable and easy to make non-alcoholic alternative to a mocktail. 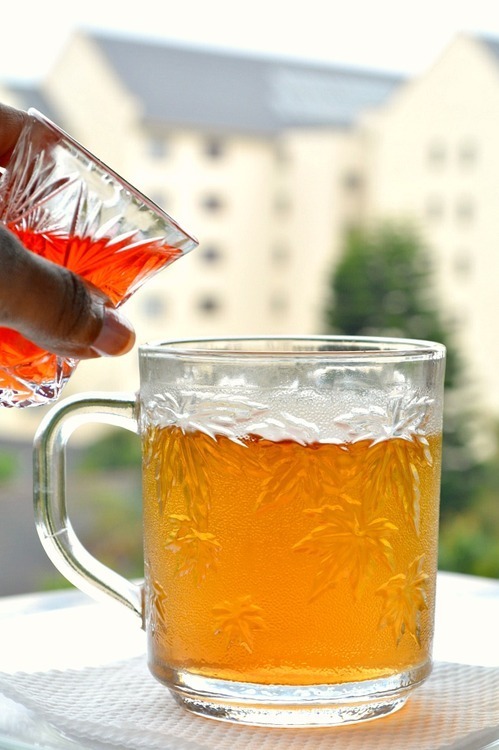 Matching the iced tea to the other drinks you serve is a great way to encourage your guests to drink responsibly, pacing out their drinks with this enticing option.